I call these Muertitas. These mixed media wall pieces explore my artistic influences and the cycles of nature. Birth, death, and rebirth are all fascinating concepts to me, and the the art of the sugar skull is a perfect visual to help me express the joy of life and my respect of finality. To learn more, check out my Press Kit Page. At present, I am not taking any commissions as I have a long list of Muertitas of my own to create. However, of you would like to get an update as soon as I finish my next set, sign up for my mailing list here. I promise the emails are sparse, and I don’t share your information. You can unsubscribe at any time. Are Any Muertitas Available for Purchase? The best thing to do is to get the most recent updates by signing up for my mailing list. Photos of them and the rest of my Muertitas are taking the form of prints, greeting cards, and iphones/laptop/ipad cases on my Society 6 store. Can you make one like <insert past Muertita made here>? No. There might be similarities, but in the end each one is unique. This keeps it true to their backstory that flies about in my brain, and more like a labour of love than just labour. Do You Sculpt A Lot? My past work is mostly acrylic and watercolor paintings focusing on character art and storytelling, so this series is brand new to me. Sculpting has always been something to enjoy, but this is the first series where I have brought anything 3-dimensional to a finish. These days, I am surprised I am sculpting more than I paint. In August 2012, San Fernando Valley based artist collective called 11:11 A Creative Collective challenged artists to create a piece from a styrofoam head for a group show called Heads Will Roll. Inspired by the generous nature of the open call, I sculpted one of the characters from an unpublished story. The spark of story to sculpture ignited, and the Muertita Clan began. You can also check out my Press Kit Page. Will we know about this unpublished story? Oh yes, and even despite how long it takes to make one. I look forward to making more. One Muertita takes days to weeks to complete since I still work full-time as an Art Director, and I make these on weekends and evenings. There are so many Muertitas to introduce to the world! Chris Rigg of Chris Rigg Photography took them. He has done an incredible job, and created something for my sculptures which is hard to do: capture the feeling of a 3 dimensional work of art in a beautifully made photo. 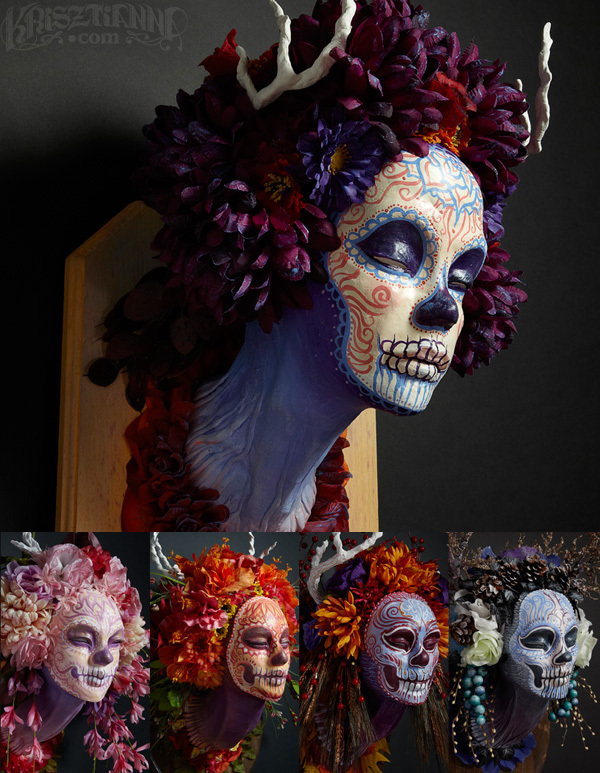 For some of the life sized Muertitas, I do resin casts or clay with mixed media. Here is a post about the resin cast process. 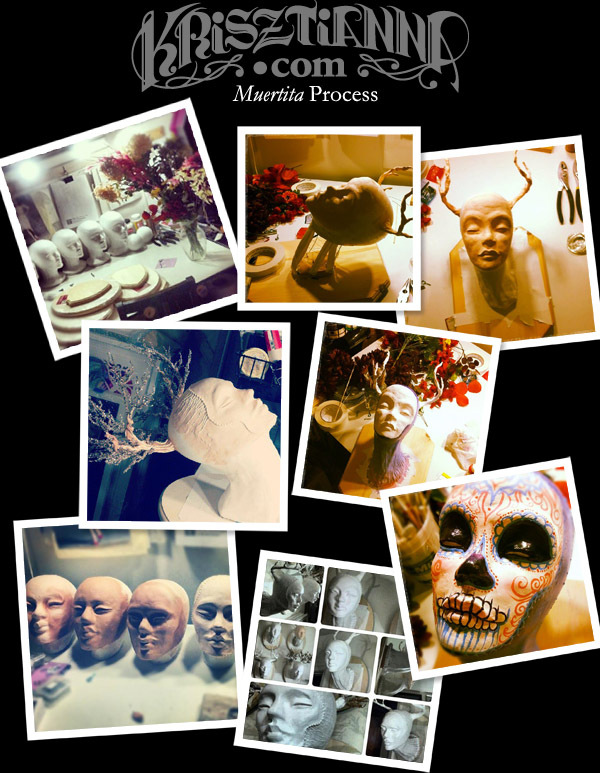 For the Mini Muertitas, the Muertititas, here is a post about my learning curve of my process.